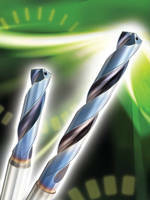 OSG Tap & Die, Inc. has just released the latest innovation in carbide coolant-through drills. The all new EXOCARB® FTO 3D and 5D drills feature; a brand new carbide substrate, a new point design, and a proprietary coating developed by OSG. In-house testing yielded up to 220% longer life versus the latest competitor designs. The new point increases sharpness and decreases vibration, permitting stable low-torque drilling. The new WD1(TM) coating extends life significantly, as it is harder and more resistant of heat than dual layered TiAlN. In addition to offering a full metric and fractional EXOCARB® FTO line, OSG offers a full-service USA regrind factory. For more information contact OSG today at 800-837-2223 or visit them online at www.osgtool.com.